A new volunteer-led service, run by Royal Voluntary Service, aims to support older people at risk from falls and social isolation and reduce the number of calls to 999. A new volunteer-led service run by Royal Voluntary Service, our charity of the year, aims to support older people at risk from falls and social isolation and reduce the number of calls to 999. The Supporting you at Home service run by the charity, will support older people through a programme of activity focused on improving their physical wellbeing and alleviating loneliness. The service is being piloted in two London boroughs - Hackney and Merton - and aims to improve the health of older people and reduce the growth of frequent callers to the busy London Ambulance Service. 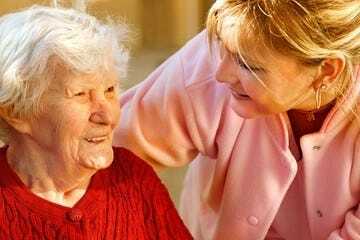 Royal Voluntary Service will receive referrals from London Ambulance Service and partnering services to support older people who are frequent callers, either because of a fall or suspected loneliness. A Royal Voluntary Service staff member will then meet with the client at their home to assess their safety and emotional wellbeing and pair him or her with a suitable volunteer. Following the assessment, Royal Voluntary Service will develop and deliver a bespoke, six-week exercise session in the client’s home to help strengthen their muscles. Volunteers will also provide essential encouragement to motivate people to get out of their home and socialise more by joining local clubs or activities. In addition, volunteers will supply clients with details of key non-emergency numbers to call if they need support, as well as discussing the importance of proper nutrition and hydration in later life. It is estimated that one in three people over the age of 65, and one in two over 80, will fall every year. Falls have a significant cost for the ambulance service and lead to poor outcomes for older people. The ambulance service is often the first point of contact when an older person falls and account for approximately 10-25 per cent of ambulance call-outs for the over 65s, costing around £115 per call-out. Royal Voluntary Service is our chosen charity. We are raising money to help fund the important work they do to improve the lives of older people across Britain, helping them stay active, independent and socially connected. To find out more visit www.royalvoluntaryservice.org.uk. organised in my locality. 83 year old, living alone. Receive excellent service from Cosyfeet.